Pioneers in the industry, we offer pipe bevelers id mount, tube bevelers, id/od mount (0.5" - 5.5") and split-frame o.d. mount clamshell machines (0.625"-86") from India. 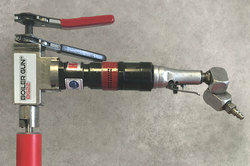 We offer 4 models of portable Pipe Bevelers for fabrication shop and on-site field use. Each model has a large working range with the power and accuracy to meet budget and schedule demands. 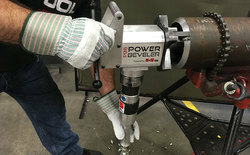 Radial tool clearance 0.8" to 2.75"
Head Width 1.6" to 4"
We offer 9 models of portable Tube Bevelers for fabrication shop and on-site field use. Our locking devices automatically center the tool in the work piece for increased accuracy. Each model has a large working range with the power and accuracy to meet budget and schedule demands. Working Range 0.625" to 86"
OD Mount Clamshell machine is a unique combination of accuracy, strength, and ease of handling. Our engineers gathered information from field operators around the world to determine the areas needing improvement over traditional designs. With that in mind, we designed a series of OD Mount Clamshell machines that provide a safer, more convenient solution for your pipe application. Our design minimizes weight while maximizing strength and rigidity with a quality aluminum body. The patented pocket-style motor mount eliminates motor twisting and ring gear damage. The mount also allows you to switch between the pneumatic, electric and hydraulic motors without the need for conversion pieces. Conventional motors are also used on the front drive adapters eliminating the need for secondary motors. With three options to choose from, the OD Mount Clamshell can cover a wider range of applications to meet the demands of your specific project. Looking for Pipe Cutting And Beveling ?